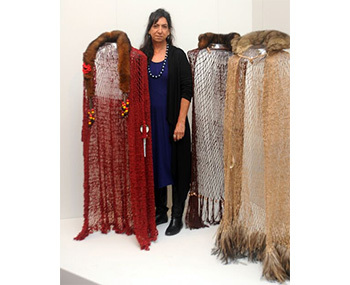 Glenda Nicholls has been awarded the $30k Deady Art Award for her woven scuptural work, A Woman's Rite of Passage. Glenda is the granddaughter of the late Sir Doug Nicholls, a talented AFL footballer and the first Aboriginal person to be knighted and appointed to vice-regal office as Governor of South Australia in the 1970s. The suburb of Nicholls in Canberra is also named after him. Originally from Swan Hill, Glenda was taught to weave by her mother and grandmother (Wadi Wadi and Yorta Yorta (Vic) and Ngarrindjeri, (SA)). Now, as a grandmother herself, she is committed to passing on her skills and knowledge to the next generation. Her prize-winning entry is in the form of three woven cloaks, created to represent Indigenous women and the role they play in Welcome to Country ceremonies. Martin Foley, Minister for Creative Industries, was at the Art Gallery of Ballarat to make the announcement last night - and also to congratulate the other winners, including Peter Waples-Crowe (West Melbourne), Troy Firebrace (Long Gully) and Brendan Kennedy (Robinvale). 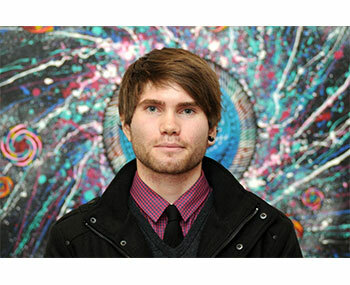 Doncaster East artist Raymond Young won the Award for 3D Works. 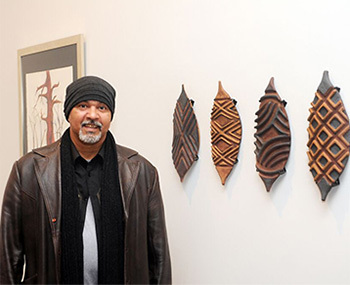 "Their works have created a stunning exhibition that showcases deep pride, connection to culture and incredible artistry. It’s an exhibition that all Victorians should experience,” he said. As with Awards elsewhere in the country, this year's entries include a mix of traditional and contemporary art. The finalists' works will be on show until 20 September. Voting is also now open for the $5,000 Creative Victoria People’s Choice Award, which can be done at the Gallery or online creative.vic.gov.au - until 7 September. Cast your vote at the Art Gallery of Ballarat or via www.creative.vic.gov.au. Voting closes 5pm, Monday 7 September 2015.